Beach Launch Team members preparing the Beach 1 rocket for launch Jan. 5 at Friends of Amateur Rocketry Site near Randsburg, Calif. Beach Launch Team's future objective is to win the Base 11 Space Challenge, a contest offering a $1-million prize to the first team of U.S. or Canadian university students that launch a rocket to the Karman Line. Courtesy Long Beach State University College of Engineering. 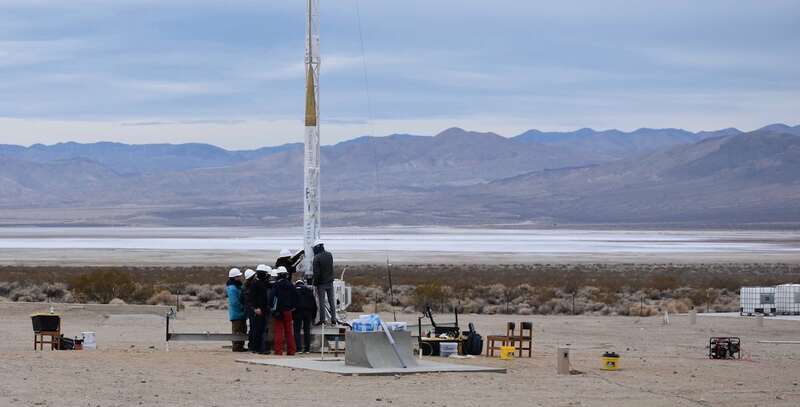 A group of Cal State Long Beach engineering students launched a rocket to an estimated altitude of 6,000 feet, the university announced Friday. 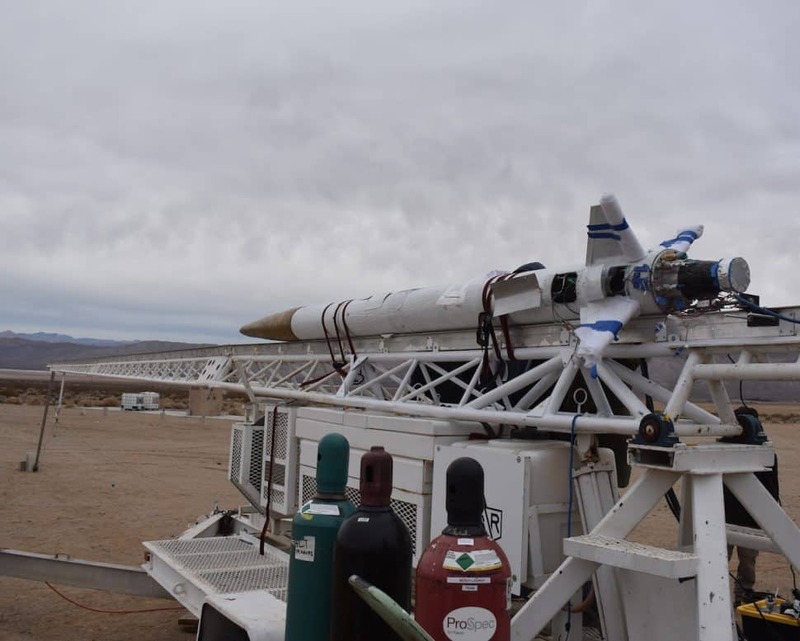 The Beach Launch Team gathered at the Friends of Amateur Rocketry Site in the desert area of eastern Kern County to launch Beach 1 on Saturday, Jan. 5. During the launch, “everyone moved and worked like an industry-grade team,” said the team’s lab manager, Christopher Tapia. It was the first launch of a rocket designed and built entirely by the students and without the supervision of industry professionals, who had provided close direction, according to Audrey Ruf, the team’s chief engineer. “This really marks the beginning of a new era for rocketry at The Beach,” Ruf said. The launch was a step toward becoming the first team of university students in the U.S. or Canada to send a single-stage, liquid-fuel rocket to an altitude of 100 kilometers, also known as the Karman Line, by Dec. 30, 2021. It’s all part of the Base 11 Space Challenge, which is offering a $1-million prize to the winner. The Beach 1 rocket, developed by Beach Launch Team students, prior to its Jan. 5 launch. Courtesy Long Beach State University College of Engineering. Beach 1 is the result of two years of tireless work and marks “a very good step toward” that goal, said College of Engineering Dean Forouzan Golshani. Several components of the rocket developed by students included the skin, fins, nose cone and communication software; it was fueled by a mixture of liquid oxygen and methane. Looking toward 2021, the team will continue to build on the lessons they learned from scrubbed launches of the past two years, as well as the success of Beach 1. For more information, visit the Beach Launch Team’s website here. Editor’s note: This article previously stated the Beach Launch Team was working toward sending a rocket into low-earth orbit. It has been updated to reflect their goal of reaching the Karman Line.